I recently repaired a couple of key transmitters for Martin (Fintro11), so thought I'd pass the info along. Both transmitters LEDs would flash when buttons were pressed, but either no response from car or intermittent function. 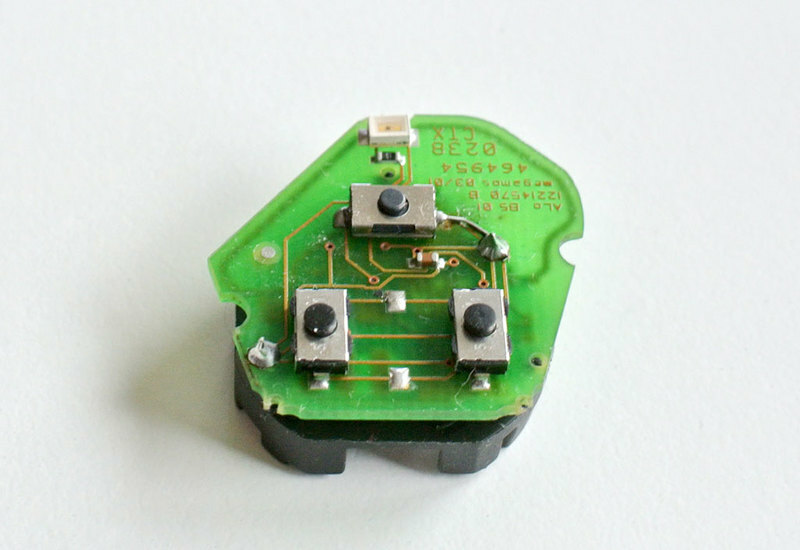 Flexing of the circuit board from years of button presses caused broken solder joints on the rear of the board. First test all buttons with a DVM set to continuity and confirm function. De-solder and remove battery holder from the rear of the board. Inspect all solder joints for breaks (will require 30x magnification inspection scope or equivalent - cannot be seen with the naked eye). Reflow all solder joints with flux, a fine tip iron and scope. 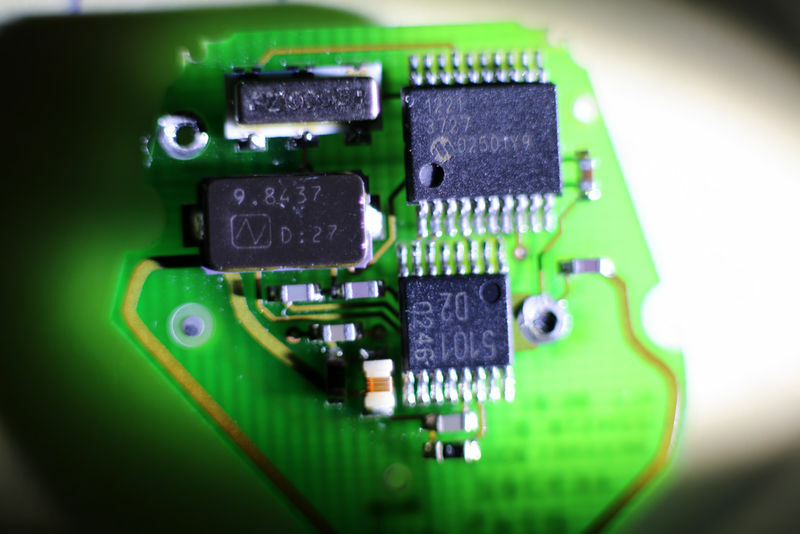 A very steady hand and some basic knowledge of electronics soldering is required. Too much heat or flux will destroy components and/or circuit traces and stray solder will cause shorts. 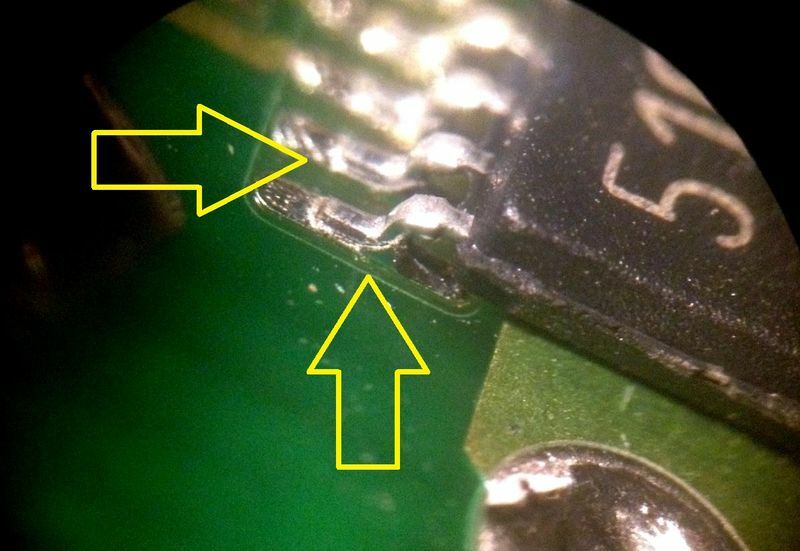 After soldering is finished, gently clean the boards with isopropyl alcohol and a soft bristle brush to remove any debris and excess flux, then examine all joints under magnification to ensure proper repair. Reattach battery holder. Enjoy your working key transmitter. This picture shows some broken solder joints under 30x magnification. Last edited by particlewave; 08-11-2018 at 10:02 AM. Can't thank Charles enough! I paid the dealer $300 + for a third key. Charles was able to fix my two paper weights! Looks like I may be sending mine off to you soon, PW. When mine doesn't "work", I can pull the upper half off and press on the battery holder to make it complete. Knew what the issue is, but my soldering skills are atrocious. Question: I have a 2004 BSSE, Is it possible to remove the electronics and the key and replace the outer case with a new one? My buttons look and feel mangled and thought a new case would freshen them up nicely. I've done this fix on my 2001 3-button key fob. It made the remote feature work reliably. Before I did it, the led light would flash reliably, but the actual remote unlocking wireless communication would not happen reliably. 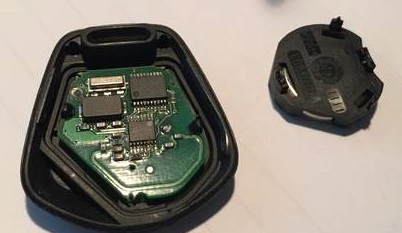 I have a second key fob that has a "lazy blinking LED" that still won't work wirelessly, even after replacing the buttons *and* reflowing the solder joints. When button is pressed, the led light flashes more slowly than on the key fob that works. You can definitely transfer everything over to a new case (blade, transmitter circuit board and transponder pill). Avoid the cheap eBay cases, though. The buttons are typically hard plastic and very hard to push. Best to shell out the extra money for OEM or a known good source. But your thoughts on sources for keys would be welcomed as this is my first Porsche and I'm a bit in shock right now! Alternatively, you can send them to me for repair at a cost of $30 each, flat rate for U.S. (add $10 for international shipping). I sent one of my keys out to Charles less than a week ago and received my repaired key transmitter from Charles today. I must say I was impressed with the workmanship. Also, the functionality of the unit. It works as new. Charles repaired bad solder joints (as expected), a broken battery connection at the board and replaced a missing capacitor. He also replaced both button switches. I've already sent my second key in for repair. IMHO the service is well worth the $30.00. Certainly beats buying a new key. I will also give props to Particlewave for fixing my transmitter. Very reasonable price and quick turnaround. I would highly recommend him if you have a key transmitterin need of repair. This is a fantastic opportunity as I am having the same issues. however, i only have one key and my 2000 S is my daily driver. I'm in Florida, and no pressure or anythign, but how long turn-around time is to be expected. I was not looking forward to spending $300 for a new key so this opportunity is seriously awesome. Sorry. I just saw this. You can keep your key so you can still drive. I'd only need the circuit board. I was wondering if you might be able to do the switch repair on my Boxster key? Have you thought about trying to reflow the solder using your oven as we do with graphics cards? No I haven't, but it may be worth a shot because one key circuit board is totally shot. Sorry, I just now saw your post. Send me a PM with your symptoms and we can go from there. Last edited by Lacostas; 12-10-2017 at 04:07 PM. Same problem here. One switch didn't work and battery drained. Couldn't find a problem on the back side (my magnification glass is only 10x), but reflowed it. On the front the conductor track near to the switch that didn't worked was damaged. Repaired it with a small wire. Baking electronic components in an oven to "reflow" isn't a good idea. Last edited by Smallblock454; 03-15-2018 at 08:50 AM. Hi all, I just purchased an 01 boxster, both keys are missing the circuit board. Any idea where to source these?